This furniture store has been closing for years, but today, 9/30/11 is the last day. Tomorrow they will auction off what is left. Check it out and see all their cats that wander about in the store and the fine smell they leave behind. No need to get out the scissors. These deals can be hand with just a click. $12 for a 12-week subscription to USA TODAY ($60 value)! $69 for a 12.1-megapixel digital camera and accessories, shipping included ($130 value). From 12 Noon to 4 PM EST or while supplies last the Swirlin’ Sawdust Workbench. Regularly $69.99 it will be $39.99 for the 4 hours or while supplies last. Shipping costs go down with the price reduction too. $50 for $100.00 of Beautiful Quality Jewelry from Dunkin’s Diamonds! Located in Columbus. $120.00 for a 2 Night Stay at The Housley House Bed & Breakfast (Reg. $240). Located in Grand Rapids, OH. Pay $13 for $26 of Authentic Mexican Cuisine located in Avon Lake! For $20, get $40 to spend on handcrafted jewelry, art, clothing, and home décor from NOVICA. Pay $49 (regularly $129) for one month worth of unlimited boot camp classes, a 21-day weight-loss nutrition program, a weight-loss consultation, and regular body measurements at Willowick Fit Body Bootcamp. Pay $25 for $50 to spend or $50 for $100 to spend on food and non-alcoholic drinks at Giovanni’s Ristorante in Beachwood. For $30, you get an Essential manicure and pedicure at Nails by Nakia, located at Creative Design Styling Studio in Cleveland Heights (a $60 value). For $8, you get a pair of Groove hanger bud headphones (a $19.99 value) including shipping (an average $4 value) from 2XL, a division of Skullcandy (a $23.99 total value). For $25, you get $50 toward any glass-blowing class or gallery item at J & C Glass Studio. •For $32, you get a Shellac manicure (a $25 value) and spa pedicure (a $38 value); (a $63 total value). •For $15, you get a haircut, blow-dry, and style (a $30 value). For $30, you get $70 worth of custom framing at The Frame Center Gallery. Valid at The Frame Center’s locations in Cleveland and Chagrin Falls. •For $45, you get one fruit-enzyme peel (a $95 value). •For $99, you get three fruit-enzyme peels (a $285 value). RESTAURANT.COM 90% OFF SALE EXTENDED! Get 90% off restaurant gift certificates! Extended tthrough 9/30/11! Get a $25 gift certificate for only $1 (normally $10). No expiration date on certificates. Get 90% off restaurant gift certificates! Today only, 9/29/11! Get a $25 gift certificate for only $1 (normally $10). RESTAURANT.COM GIFT CARDS 80% OFF! One day only! Today, September 28th – all gift cards are 80% off. Use them on future purchases. Comes in handy at the beginning of the month when they aren’t on sale or are at 50% or so. Plus use code FALL to get regular gift certificates 80% off! Get 30% off your online deal at Kohl with code: SAVING30. Good from 9/28/11 through 10/5/11. Check your mail for an ad for Party City with a $10 off a $25 purchase or more coupon. You can also go online with the deal – use code PC83JA. Expires 10/3/11. $7 for $14 worth of girl’s hair accessories from Ana & Miki, plus free shipping! $10 for $20 of Specialty Pizzas, Pasta, Wings and More at Cala’s in Willowick! $12.50 for $25 Towards Screen Window or Door Repair from the Cleveland Paint Co.! $4 for $8 of Bear Creek Coffee, Pastry, Soups, Salads, Juices & More! Located in Mentor. Try on this deal from Beyond The Rack. Pay $10, and get $20 to spend on brand-name clothing plus free shipping on your first purchase (a $30 value). You’ll enjoy $15 to spend on ice cream and drinks at Pav’s Creamery at Lockwood Corners for just $7! $9 for a One-Year Subscription to “Akron Life Magazine” (Up to $19.95 Value). Use Akron for city. For $22, you get one foot massage and one detox treatment (a $45 value). For $45, you get any one-hour massage (up to a $90 value). For $50, you get three foot detox treatments (a $105 value). For $60, you get a one-hour massage, foot detox treatment, and a foot massage (up to a $135 value)..
For $20, you get $40 worth of prime rib and fish at dinner at Prime Rib Steakhouse. Loacted at 740 West Superior in Cleveland. For $10, you get $20 worth of dinner fare Friday or Saturday. For $12, you get $25 worth of dinner fare Monday–Thursday..
For $20, you get one BYOB pumpkin-carving class (a $45 value). For $20, you get one BYOB canvas-painting class (a $45 value). For $20, you get one BYOB beer-mug-painting class (a $45 value). For $20, you get one BYOB wineglass-painting class (a $45 value). Look for 7 day free pass in Red Plum insert at Fitness 19 in Wickliffe. Earn 20 cents in fuelperks with the purchase of $50 in restaurant gift cards. Over 50 restaurants available. Through 10/5. There have been rumblings that Giant Eagle is planning to announce a new coupon policy. Many fear that doubles will go away, however from what I understand instead it will be a new program that will offer more manufacturers coupons to consumers. So it’s a good thing! Let’s hope that is the case as I know myself and most other couponers wouldn’t want to shop at Giant Eagle should they do away with doubles. Many coupon policies have been changing for the worse, especially since the debut of Extreme Couponing, but some are actually improving their coupon policies. For instance, Buehlers started to double coupons. Wal-mart is also testing doubling with the thoughts to go nationwide. But many stores have new limitations for the worse including limiting like coupons and limiting internet coupons amounts. Some are not allowing double BOGO’s (a buy one get one free coupon used with a buy one get one free sale). Stay tuned, but any couponer knows that when a store limits coupons it lessens the chance shopping there and thus the store won’t sell as many other items lowering its sales volume. Look for $5 off $50 purchase in ad. Get tools up to 80% off online. Unlimited double coupons up to 99 cents! Through 10/1/11. 80% off on clearance items. Great time to get summer clothes. Purchase online and pay 99 cents for standard shipping per item or free shipping with purchase over $50. Buy $50 worth get $10 in Kohl’s cash. Free Family Fun dog training seminar – Sat & Sun, Oct 15 & 16 at 2:00 PM at participating locations. Buy two of the same HP Toners and get a $20 Visa prepaid card via Easyrebate at Staples.com! Look for $3.50 off $10 purchase in ad. Be aware that Walgreens changed its policy for multiple item sale prices. If the ad says 2 for $5 each item is $2.50, but if you buy one it will cost ther regular price. Lame. Walgreens stocks their register rewards items poorly so this is another reason why not to want to shop there. Get free coupons and register your loyalty cards on the Your Bucks section to get additional register coupons. …and over 150 more coupons! NEW 2012 BOOKS NOW AVAILABLE! Hundreds of coupons for Northeast Ohio area restaurants, golf courses, fast food, pizza, dry cleaning, wineries, entertainment and more! Best coupon book available! Coupons cover an area from Amherst to Ashtabula to Akron! Only $28 and Free Shipping! It’s like getting 1,000 Groupons, but for only $28! HIGHLIGHTS* New restaurant coupons include Carrie Cerino’s, Wood & Wine, Chocolate Bar, Guarino’s, Mia Bella, Mezcal, Tequila, Valley Junction Family Restaurant, Mavi Winkle’s, Frankie’s Italian Cuisine, Lone Tree Tavern, Vivo, Knotty Pine, Willoughby Brewing Company and many more! * The book will pay for itself after 1 or 2 coupons. It’s like finding a gift card on every page! * 160 Fine Dining Restaurants with savings of $10 or more. Most offer half off dinners for those dining alone! 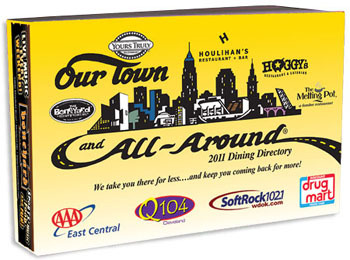 Go to Our Town All-Around.com to see what is in the book. * New this year is our “Spice Up Your World” section featuring restaurants that are serving up all your zesty, flavorful dishes. * WINERIES – Over 30 coupons for wineries from across Northern Ohio. * GOLF – Coupons for over 72 free rounds of golf. * MISC. COUPONS – Coupons for dry cleaning, tanning, Pat Catans, Sav-A-Lot, Gale’s and much more! * Coupons good now through December 1, 2012. Want to find out how to save money on a variety if topics? I have a 175 page booklet filled with tips and tricks to save money. Great for someone just starting out or wants to learn more ways to save money. Only $10! 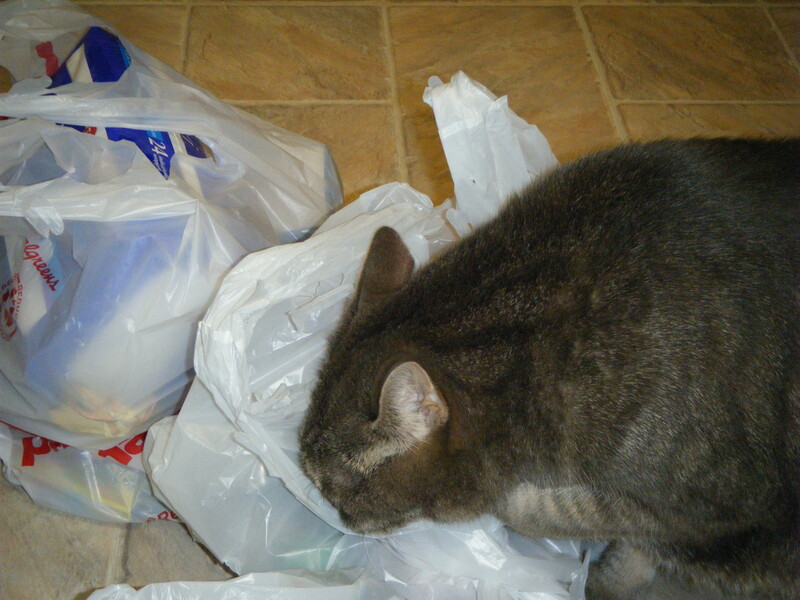 For some reason my one cat likes to lick plastic shopping bags. He starts licking them as soon as I bring them in the house. Freak. I for one found that they don’t taste all that great. Vote for my blog – joethecouponguy.com! September is National Coupon Month. You can vote for your favorite coupon blog and have a chance to win a $50 grocery gift card. Even if you can’t stand my blog at least try to win the gift card! Unfortunately poverty rates are still high this year. While those households making $200,000 or more seeing income unchanged from 2009 to 2010, households making less than $35,000 annually grew. The economy has hurt the poorest the most. Cleveland was ranked #3 in poverty with 34% of its population in poverty. Detroit was first at 37.6% and San Bernadino, CA was second at 34.6%. Rochester, NY was fourth at 33.8%, Miami fifth at 32.4%, Laredo, TX sixth at 31.4%, Cincy seventh at 30.6%, and Newark, NJ eighth at 30.2%. The federal level of poverty for a family of four with two children earns $22,113 annually. Good jobs are just not being created even though tax cuts were extended and corporations are sitting on over a trillion dollars in cash. A Brookings Institute study found that of the 10 most common occupations in Ohio, most don’t pay enough to keep a family of three out of poverty. Incredible. Sure it’s great to create jobs, but are they good jobs that can support a family. Day care is so expensive that sometimes it doesn’t even pay to have one spouse work. The poor and middle class need help with good jobs and the policies should reflect it…so should the people representing us. Remember the skit on Saturday Night Live with Alec Baldwin and the two gals playing NPR radio co-hosts? The SNL gals nailed it acting like the typical soft spoken public radio hosts. Very hushed and deliberate. And then Alec Baldwin brought up his Schwetty balls recipe. That skit was a classic. Well, now you too can now get Schwetty balls! Ben & Jerry’s Schwetty balls that is. Salty and sweet at the same time. I saw them at Giant Eagle. The ice cream that is. It’s called Ben & Jerry’s Late Night Show ice cream…a bit more discreet with the name. Linda, a host on the WELW show I’m on brought it up the other week that they were selling it. Apparently people are calling Giant Eagle and other stores and asking if they have Schwetty balls. After a hang-up or two they find out they are not kidding. I made a special trip to go back into the store after I remembered to see if they sold it. Of course, it was after I checked out. I didn’t want to ask a stocker or cashier about it to see if they had it in stock. Then again with some I wonder what kind of answer I would get if I asked them if they had Scwetty balls? Here’s a comment I do from a spammer. I thought it was timely with the above story. Those rascals sure have a way with words. Wonderful site. A lot of useful information here. I’m sending it to several pals ans additionally sharing in delicious. And of course, thanks to your sweat! 70+ Popular Magazines – Just $3.99 with this coupon! Save an add’l 17% on your entire order! Small towns, big deals! Save up to 30%. Casino Sale: Free Nights and More! Hotels.com Canada: South America on Sale – Save up to 50%! Hulu is an online TV service. Hulu Plus™ offers hit TV shows and award-winning movies anytime in HD. Watch any current season episode of top shows like Modern Family, 30 Rock, Glee, and many others, enjoy classic series, or explore acclaimed movies. Available on gaming consoles, tablets, smartphones and many more devices for $7.99/month with limited advertising. A change by Netflix will make Hulu more popular. Netflix has lost half its market value since July, when it announced that customers who wanted DVDs and streaming had to pay for them separately and pay up to 60 percent more. Netflix will still offer the familiar discs in red envelopes and another for online streaming of TV shows and movies. The DVD service will be called Qwikster. The streaming service will keep the Netflix name. Hawaiian Vacation Deals: Save up to 50% on Flight+Hotel with Travelocity. The SCOTTIES $10,000 Family Field Trip Sweepstakes is back, with a few new exciting destinations to choose from! Enter the sweepstakes DAILY, from now until October 15th, for a chance to WIN a $10,000 family field trip to one of the following U.S. destinations: New York, NY, Grand Canyon, AZ, Washington, D.C., Orlando, FL or anywhere’s in New England! You will also be eligible to win 1 of 80 secondary prizes, including, laptop computers, gift cards and packages of SCOTTIES Facial Tissue, which now has up to 30% more tissues than the national leading brand! Get a FREE 3 oz. serving of “Sprinkles with Wishes” ice cream creation on Tuesday, September 27th at participating Cold Stone Creamery locations between 5:00 to 9:00 pm. It’s their 10th Annual Ice Cream Social. 7-Eleven is offering a FREE medium-size cup of hot coffee, cappuccino, or latte from 7:00 to 11AM, September 29th!! Krispy Kreme will celebrate National Coffee Day and its new Krispy Kreme Signature Coffee Blends by giving away a FREE 12oz cup of House Blend Coffee. No Purchase Necessary. Bar Bites (mini appetizers) – $2.95 in bar area from 3 to 7 and 9 to close. Signn up to get their e-mails and get extra deals – I just got one for a BOGO deal up to a $15 value. Located at 8500 Station Street in Mentor. Location downtown, Mayfield, & Avon Lake. All Hotdogs are 2 for 1 on Mondays. * Kids Under 5 can eat free! Kids Under 5 will receive a free plain hotdog and their choice of a bottle water with flavor packet or milk. * Kids Between 6 and 12 will receive 50% off their purchase. Every Saturday Night at Avon Lake Tucky’s, we are hosting a FREE Classic Car Cruise In from 5pm until 8pm. There are door prizes, food promotions, a 50/50 raffle and a DJ playing your favorite classic hits. Can you eat all five of the division dogs in 5 minutes or less? If so, you will earn a Division Dog Challenge t-shirt, $15 in Tucky’s Bucks, and have your photo placed on our wall of fame. If your time is in the top ten, then we will place your name on the record board. If you’re interested in booking a class for your organization, please contact me at joe@joethecouponguy.com. Wednesday, October 19, 2011 – 7:00 PM – Travel Class – 2 Hour Class – Aurora Community Education – Register at https://recpro.auroraoh.com or call 330-562-4333. Fee. Wednesday, October 26, 2011 – 7:00 PM – Savvy Shopper Class – 2 Hour Class – Aurora Community Education – Register at https://recpro.auroraoh.com or call 330-562-4333. Fee. Look for an extra 20%, 25%, and 40% off coupons in the Cleveland Plain Dealer’s Saturday, 9/24/11 front page section. •For $6, you get two admission tickets (up to a $12 value). •For $12, you get four admission tickets (up to a $24 value). Admission is free for members and children 5 and younger. Admission is $3 for children ages 6–12. 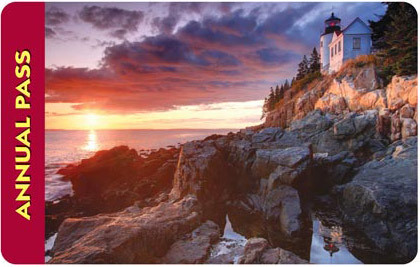 Entrance fees waived at National Parks on September 24, 2011 (National Public Lands Day). This is an annual admission pass covering admission and standard amenity fees. This replaces the National Parks Pass and Golden Eagle Pass. Can be obtained in person at a federal recreation site, or by calling 1-888-ASK USGS (1-888-275-8747), Ext. 1, or online. Get 80% off already discounted restaurant gift certificates! Get $25 gift certificates for $2 (normally $10)! Many sell out at the beginning of the month. Get them before they’re gone! Over 18,000 restaurants to choose from all across the country! Over 250 in the northeast Ohio area. Use them on your dates! No expirations date on the certificates! 79% off advanced LED teeth-whitening kit, plus free shipping at Smile Guru! Pay only $32 ($149 value)! Pay $25 for $75 worth of custom photo books, cards and calendars from Picaboo.com! Pay $10.00 for $20 of Amazing Traditional Mexican Fare at Marcelita’s in Hudson! Pay $36 for One Day of Unlimited Golf for 4 Including Cart! ($112.00 Value) at Deer Pass golf course in Seville. Look good with this deal at Organique Derma Spa & Salon in Westlake. Revitalize your visage with either a Jet or Diamond Peel Facial for $70, 53% off the original $150. Or, for $40, you can send unwanted hair to time-out with a sugar waxing to remove hair on your bikini and underarm areas (a $95 value). Better yet, play around with your look with $25 for $50 in salon services, including massage, hair, and nail treatments. Empowering Punch is offering this whammy of a deal. Get six weeks of youth boxing classes for boys and girls ages 8 to 12 for only $70 (regularly $149). For $20, you’ll have $40 to spend on food and non-alcoholic drinks at Master Pizza in Mayfield Heights. Great eats and a great deal at Lago Restaurant & Wine Bar, located on Professor Avenue in the center of the town. Pay $40 for $80 to spend on food and drinks at this Italian eatery. For $99, you get a Brazilian blowout hair-smoothing treatment at Studio 247 in Chagrin Falls (up to a $350 value). •For $6, you get one ticket to see Frontiers – The Journey Tribute on Friday, September 30, at 8 p.m. (a $13 value). •For $8, you get one ticket to see The Mega 80’s on Friday, October 7, at 8 p.m. (a $16 value). For $7, you get two 16-ounce smoothies at Organic Energy Restaurant and Power Juice Cafe in Solon. For $99, you get $300 worth of custom window treatments from 3 Day Blinds. $25 for Two Hours of Bowling with Shoe Rental for Up to Six People and Pitcher of Pop (Up to $68.38 Value) at Fairview Lanes. For $2, you get five one-night DVD rentals from Blockbuster Express (a $5 value). Use Youngstown for the city. 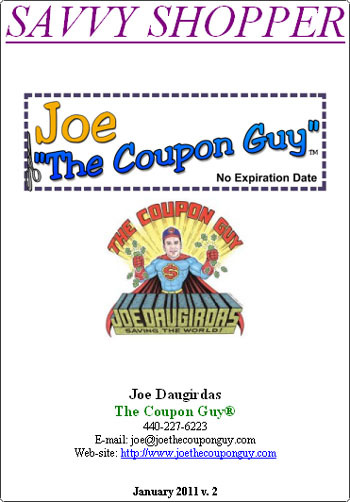 You are currently browsing the JoeTheCouponGuy.com Deals Blog blog archives for September, 2011.